Already in 2017 IGT have delivered us some pretty tasty big-hitting high volatility slots – Get Clucky and Magic Castle amongst them. 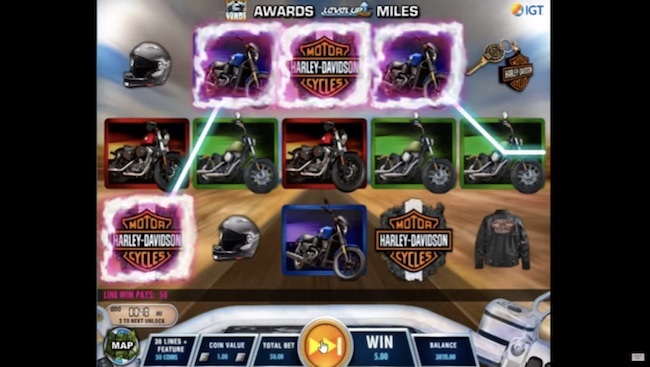 With Harley Davidson Freedom Tour slots we have a lower variance game but one that packs a punch with a superb set of features and bonuses, including Free Spins, Wilds and of course, tons of Multipliers. 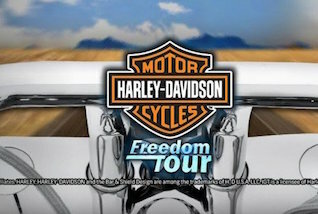 So, the volatility rating here is low to medium and Harley Davidson Freedom Tour RTP ranges from 92.5% to 96.6% – it goes up as you unlock bonus features. There are five reels and 30 paylines and the game has a built-in level-up feature that rewards you with more, the more you ride. One of the games highlights is a Rumbling Wilds Mystery game that can turn four symbols into Wilds. You can play this game for free or for real and on your mobile, desktop or tablet at many UK online casinos. We recommend you try Casumo Casino. Or read on for a full game review, including an explanation of all the bonus rounds and gameplay. The theme here is, of course, motorcycles and a classic, iconic motoring brand. The game features lots of great imagery – motorbikes, keyrings, helmets, jackets, and the famous HD logo. The backdrop is an open road and the reels sit atop the front of your bike – it looks like you’re driving fast up a long highway! Cool, huh? The highest–paying symbol is the HD logo which is also the Wild and substitutes for all others, except the scatter. You can play this video slot game from IGT from 50p up to £500 per spin – just toggle the bet arrows at the foot of the gamescreen up and down. There is Max Bet option to jump straight into big bets, an Autoplay for hands free, and the option to turn sound on and off. Just like IGTs Cleopatra Plus, this slot game includes a Level-Up format, in which more gameplay means higher levels, and more potential payouts. As you play, if you hit a bonus symbol on reel 1, 3 or 5, you earn extra road miles. For each 10 miles collected, you move another step on the road. There are six levels in total. Road to Riches Bonus Feature: If you hit the bonus symbol on reels 1, 3 and 5 simultaneously, the Road to Riches feature is initiated. This is basically a wheel that opens in a new window, with prizes of up to 200x multiplier. This includes an RPM Multiplier where increased revs increase the multiplier values. Free Ride Free Spins: Here you get 3 Free Spins that include an extra Wild on the 1st spin, two on the second spin, and three on the third. Showroom Bonus: Here you have a Pick-Me game and you can receive up to 10 picks, each with a 5x multiplier that can drive pretty decent wins. Custom Shop Bonus: In this round you’re asked to pick emblems for a bike to put together all the different parts of the bike and ‘complete’ it. There are three different bikes, from Bronze (15x multiplier) to Gold (200x multiplier). This is a really entertaining slot game from IGT – the various bonuses and features are really well thought through and give plenty of fun. You can enjoy Harley Davidson Freedom Tour Slot with a modest bankroll for a good time as its pays out regularly. For us, it’s one of IGTs highlights for 2017.